China's currency is expected to break the key 7 to the dollar level later this year or next year, a level some currency experts believe will spur more selling pressure. The U.S. Treasury refrained from calling China a 'currency manipulator' Wednesday, and the next day the currency continued its decline. But strategist say the weakening currency has more to do with domestic problems, like a softening economy and steep losses in China's domestic stock market. Strategists expect China's weakening currency to eventually fall through a key psychological level that could spark an even steeper drop and, no doubt, draw a new round of criticism from the Trump administration. The Treasury Department on Wednesday refrained from naming China a 'currency manipulator' in its biannual currency report, but it kept it on a watch list with several other countries. China was specifically called out for its 'lack of currency transparency and recent weakness in the currency." A weaker yuan helps insulate China against some of the impact of trade tensions because it makes exports cheaper. The yuan on Thursday fell as China's stock markets sold off sharply amid fears of margin calls and more losses. The yuan touched 6.94 to the U.S. dollar, its lowest level since January 2017. Markets are watching to see if it will get to 7 yuan to the dollar, a level not seen for 10 years. "Its a red line because it's psychological and also because China previously seemed to defend it verbally," said Marc Chandler, chief market strategist at Bannockburn Global Forex. He said the move to 7 is likely but not until after President Donald Trump and Chinese President Xi Jinping meet in November, and discuss trade. Strategists say the trade conflict between the U.S. and China is a factor that has been strengthening the dollar, and weakening the yuan. 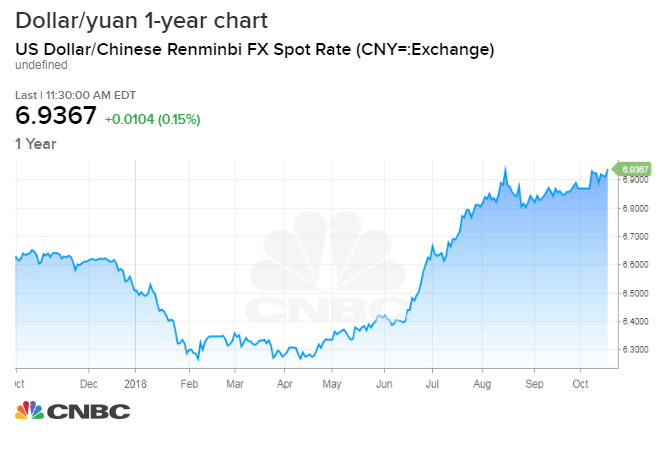 The yuan began falling markedly in June when trade tensions flared. But strategists say there are other factors at work that have been weakening the currency, and much of them are domestic, including the steep drop in stock prices. Shanghai stocks were down 2.9 percent on Thursday and are down 25 percent since the start of the year. Some strategists say China has been trying to prevent the yuan's decline from becoming too disruptive or triggering a capital flight out of the country. But a number of them say China could also now let the yuan fall through 7 later this year or next year. "Typically, it's seen as an important psychological threshold but now that the renminbi is falling from 6.3 to 6.9, and there's been no significant outflows form China, we think the PBOC is confident they can manage a further fall below 7 without a destabilizing decline." said Chang Liu, Chinese economist at Capital Economics. There are signs that China is trying to support the renminbi, as the yuan is also called. September data from the People's Bank of China shows the central bank tried to stem losses. "They sold FX to support the renminbi...about $17 billion worth of reserves, the most since the start of 2017," Liu said. The People's Bank of China each day sets a rate for the yuan, allowing it to trade in a band against the dollar that is 2 percent on either side of its midpoint value. That is the onshore currency, or CNY. The offshore currency CNH is used by foreign investors and banks, and it typically lags the CNY. Jonas David, emerging market strategist at UBS Global Wealth Management's chief investment office, said the declining yuan is linked to the softening of the Chinese economy. "We clearly see an economy that is softening. We see further monetary and fiscal policy easing," he said. David said he expects to see the yuan reach 7.10 over the next six months and 7.30 to the dollar within a year. "In our view there's no reason why the depreciation of the Chinese yuan should stop at the level of 7. It's a psychological level, but we actually think the Chinese yuan will continue to weaken," said David. When the Treasury issued its currency report Wednesday, Treasury Secretary Steven Mnuchin said in a statement that China's lack of transparency and weakening currency pose "major challenges to achieving fairer and more balanced trade, and we will continue to monitor and review China's currency practices, including ongoing discussions with the People's Bank of China." Liu said the weaker yuan has helped China avoid the worst impact of trade tariffs. "So far we think the tariffs impact will more or less be offset by the fall in the renminbi. We'll see a bit of an increasing headwind next year, as tariffs come up. The economy is slowing but mainly due to domestic factors, the policy makers have been tightening policy since 2016 to earlier this year," he said, adding a credit slowdown has had an impact on the economy. But since May, he said there's been a shift in priorities and China is now using stimulus to boost the economy and encourage bank lending. China's third quarter GDP is expected to show a slight decline Friday, falling to 6.6 percent from 6.7 percent. "There's a lag between the start of policy and how long it takes to feed through," said Liu. "We think it will slow for another nine months."